Better than ePTFE Poly tetra fluoro ethylene barrier membrane due to its bio Resorbable nature. ► HEALIGUIDE is contraindicated in infectious and contaminated cases of oral cavity. 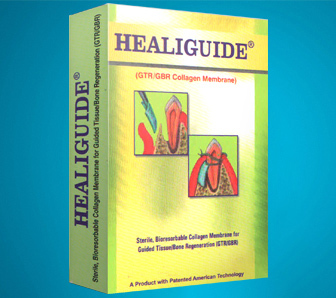 ► HEALIGUIDE is contraindicated for highly sensitive patients for collagen materials. ►	HEALIGUIDE is contraindicated in clinical situations where any surgery should not be performed. Like any other surgical procedure, care to be taken to monitor the health condition and the medication like steroid or anti coagulants taken by the patient which might affect the surgical procedure. Proper caution has to be taken when using in pregnant women and children as patients. HEALIGUIDE cannot be re-sterilized or re-used. Once the packaged vial is opened, the unused portions of the HEALIGUIDE have to be discarded. HEALIGUIDE has to be stored under normal room conditions of humidity temperatures between 4° to 49°C or 39° to 104°F. HEALIGUIDE would have a minimum of 3 years shelf-life.